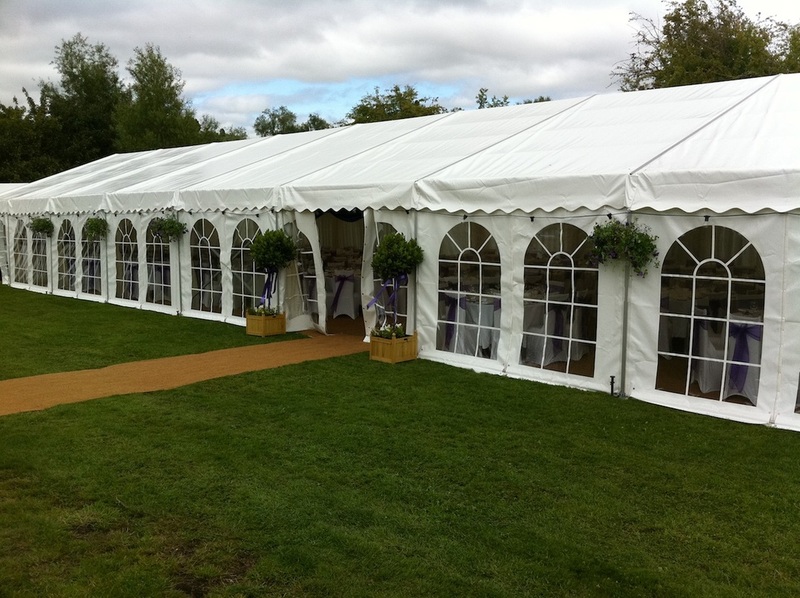 Clearspan or 'frame' marquees are the most popular type of marquee on the market. The reason for this is because they are extremely adaptable, very attractive and have a wide range of options both inside and outside. They don't have interior poles or guy ropes because unlike a traditional/pole marquee they are held up by a strong aluminium frame. 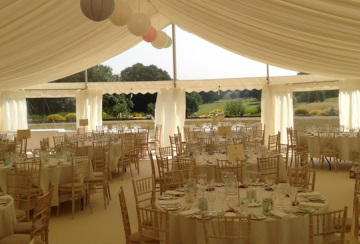 There are two different types of window available on a clearspan marquee. Both can easily be opened if it's a hot day and even removed altogether if it's very hot. Georgian windows are more attractive from the outside and offer a classic look whereas Panoramic windows really make the most of good views. 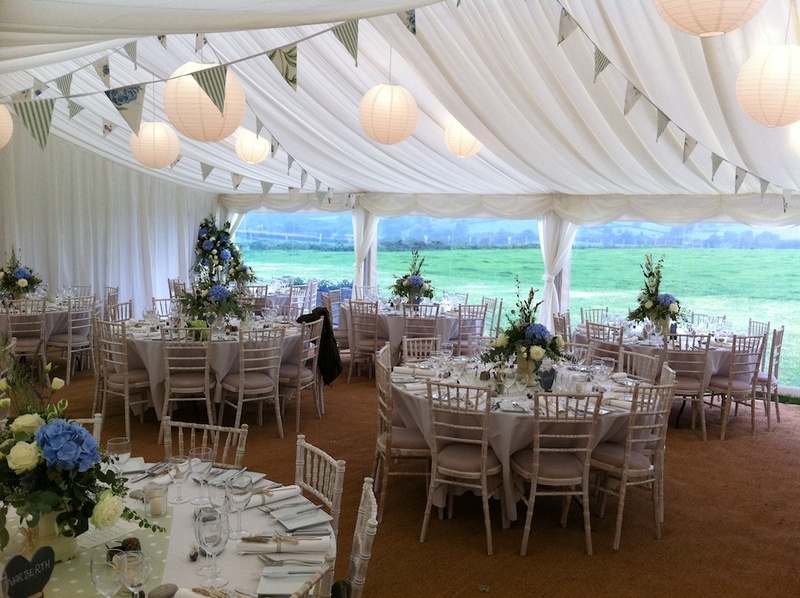 It's usual to position a marquee side-on to a good view and make the most of it with a run of windows. But what if there's a good view at the end of the marquee too? 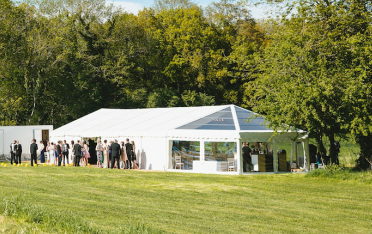 Using a clear gable (a gable is the triangular shaped bit above the walls at each end of the marquee) combined with panoramic windows really maximises views and light within your marquee. Clear roofs certainly add 'wow' factor. They can be positioned anywhere on a marquee and are ideally placed over bar/chill-out areas, particularly if you have trees nearby that can be lit up and viewed through the roof. 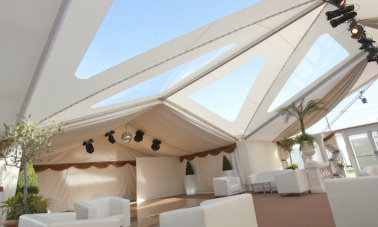 Clear roofs are ideally suited to events held between Autumn and Spring and Summer evenings because it can get rather hot underneath them when sunny. The end of a marquee is flat and one-sided but with a hex end (or bell end) you get 3 sides on a 9m wide marquee and 5 sides on a 12m wide. They look great when utilised as bar/chill-out areas, or housing the top table or even dance floor. We stock both white roofs and clear roofs. This is a really great marquee gadget. 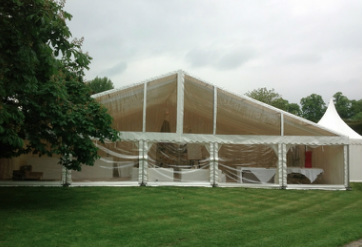 A cruciform or 'dormer' section joins a 12m wide marquee to a 9m wide at 90 degrees to create a T or L shape, but cathedral style so you don't have any legs in the way where the two structures meet. The clear sections in the roof make it look extra special and you can either have it half-lined in pleated ivory with clear sections exposed or fully lined so that they're covered. Alternatively, you can have the whole cruciform section un-lined and instead hang drapes below in a sort of bicycle spoke configuration. 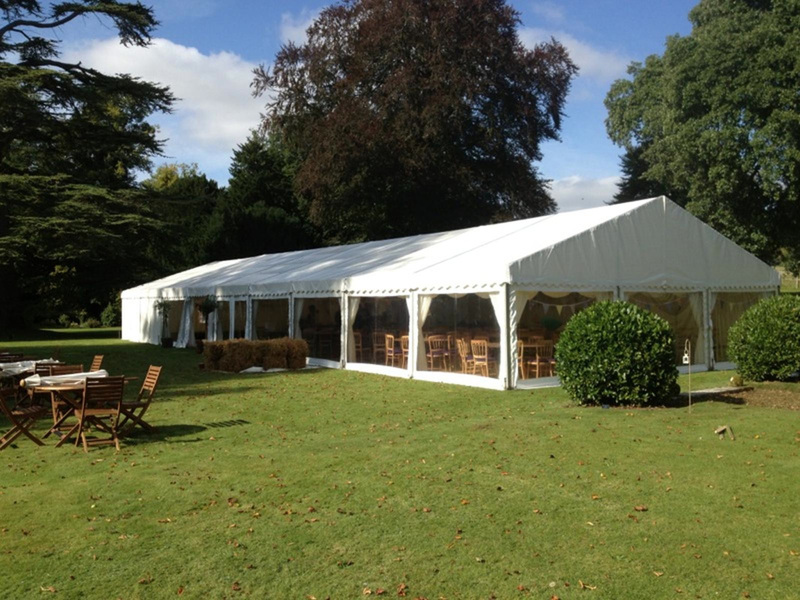 Add a hex end to the cruciform section and you have yourself a visually striking marquee. 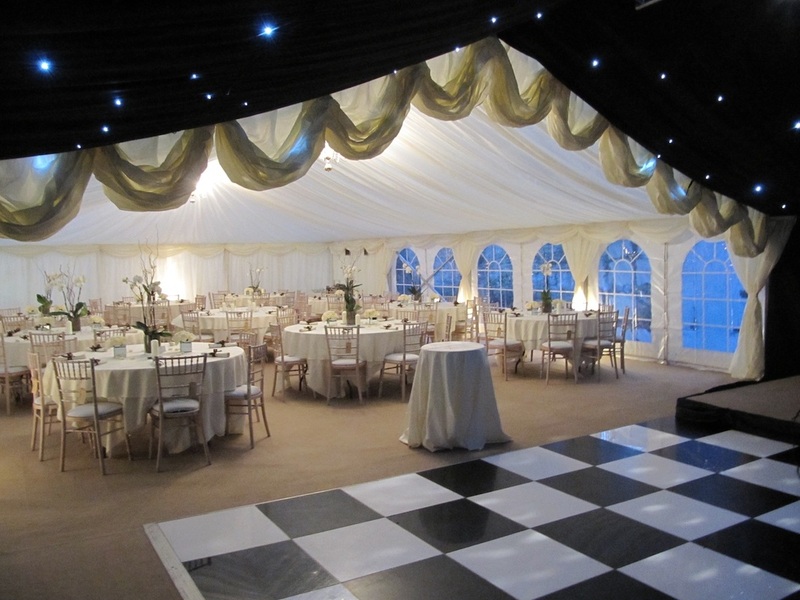 This is the ultimate in marquee flooring. With a cassette floor, the wooden floorboards are dropped into an aluminium aerospace grade frame which the marquee legs then slot into thereby creating one solid structure. And because the wooden boards sit in a frame, the frame can be levelled to perfection in order to eliminate slopes and bumps. Marquee heaven! A clearspan marquee frame allows us to create a covered verandah area for your guests to relax on comfy sofas or smoke without getting wet. Rather than position the gable (triangular roof piece) and windows/walls at the end of the marquee, we install it 3m or 6m within instead. The verandah area floor can be floored the same as the rest of the marquee or decked to offer a true verandah experience. The covering roof can be white or clear. To properly eliminate drafts, prevent heat escaping and provide a more conventional entrance we can supply doors with your marquee. These can be either white French doors or aluminium fire escape style doors with a push bar.